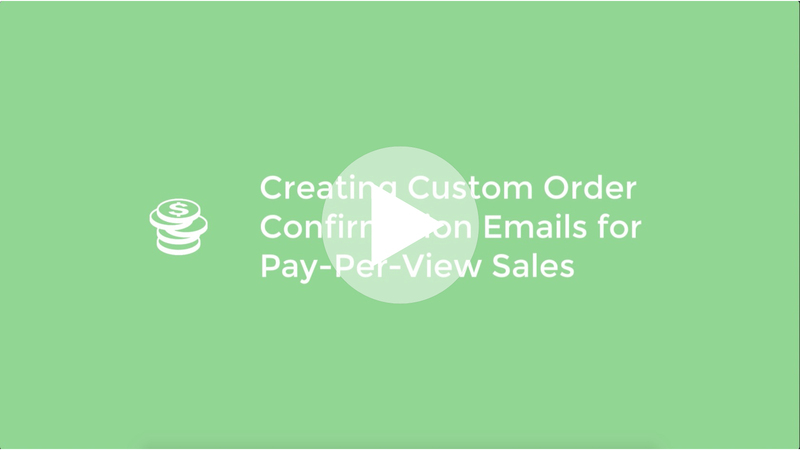 Create custom emails that are sent to your buyers. When your clients buys one of your Pay-Per-View videos, they are sent a Default Order Confirmation Email from us. You can create your own Custom Order Email Confirmation within your Management Panel. Giving your clients a fully personalised experience. If you want to check out some Pay-Per-View Demos and extra information please visit our Pay-Per-View information page. In your management panel go to ⚙️ Settings > Pay-Per-View 🔽 > Order Confirmation Emails. Here you will see a list of your current Order Confirmation Emails as well as the Default Order Confirmation Email. To create your new Custom Order Confirmation Email you will need to click on the ➕New Confirmation Email button. Now in the New Email Setup Panel in the center, give your Custom Order Confirmation Email a name. Mail Server SMTP Details: Here you can choose from which email server your Confirmation Emails are sent. By default you can use our own Internal Default Server or you can setup your own email server. For Instructions on connecting your own email server to send the confirmation emails, please see our tutorial here ->. Email Sender: Enter the email address you would like to appear as your sent address in your Order Confirmation Emails. Email Subject: Enter the email subject you would like to appear on your Order Confirmation Emails. Email Body: Enter the text you would like to appear to your buyers in your order confirmation emails. You are able to insert Variables that will automatically add the correct details and replace the corresponding Variables. Buyer Email - %name% - Replaces the variable with the buyer's email address. Ticket Type - %ticket_type% - Replaces the variable with the type of ticket your buyer has purchased. Passcode - %ticket_refcode% - Replaces the variable with the Password with which your buyer can access the video. Ticket Title - %ticket_sales_label% - Replaces the variable with the title from your ticket that your buyer has purchased. Ticket Description - %sales_description% - Replaces the variable with the description from the ticket that your buyer has purchased. Direct Video URL Link - %ticket_link% - Replaces the variable with a direct link to the video player your buyer has purchased. Ticket Price - %ticket_price% - Replaces the variable with the Price from your ticket that your buyer has purchased. Ticket Expiry Date - %expire_date% - Replaces the variable with the expiration date of the purchased ticket. Total Allowed Views - %watch_limitation% - Replaces the variable with the total allowed views of the purchased ticket. Video Title - %video_title% - Replaces the variable with the title of the video your buyer has purchased. Max Allowed Views Per Video - %max_allowed_watches_per_video% - Replaces the variable with the total maximum allowed views per video of the purchased ticket. Payment Type - %payment_type% - Replaces the variable with the the type of payment that was used by the buyer to purchase the ticket. Once you have finished editing your Custom Pay-Per-View Confirmation Email, simply click on the green ✅ Save button to save your changes.